enter the code and click "Redeem!" Telltale Games' The Walking Dead (game), Season One is a game which defined a genre and changed the stories that can be told in a video game. The Walking Dead is based on an award-winning comic book series under the same title created by Robert Kirkman and Tony Moore.Prepare to make weighty choices to decide what course the story will take, in a faithful recreation of the source material's visual style. Follow the story of Lee Everett, a convicted murderer who was being transported to prison when the zombie apocalypse broke out. The Walking Dead defined and cemented the signature style of Telltale Games productions. Watch the events unfold in front of Lee Everett and help him make decisions on what needs to be done. But beware, each decision carries consequences, and there are no good choices to be made. As the story progresses Everett and you will decide on who lives or dies and define the relationships with other people in your group of survivors. Many decisions have to be made under significant time pressure and making no decision is a decision of its own. The Walking Dead makes sure the moment of choice is as interesting and engaging as the consequences haunting you in the future. The original The Walking Dead PC comic books did not shy away from tackling hard topics and brutal realities of life during an apocalypse. 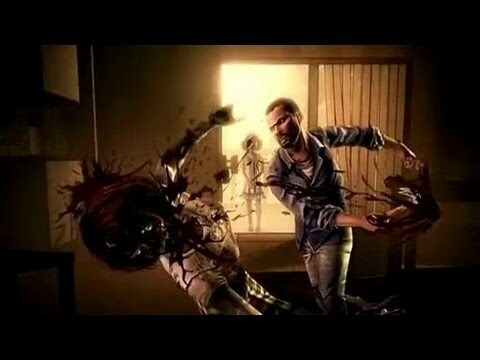 Telltale Games' production follows closely in its footsteps.The Walking Dead, Season One tells an original story. See the early stages of the apocalypse through the eyes of Lee Everett. He is a former history professor and a convicted murderer forming a group of survivors starting with Clementine, a young girl with nobody else too look out for her. Teach her to survive while maintaining her innocence in an impossible balancing act bringing at least some hope to a brutal world of The Walking Dead. See familiar locations and talk to familiar characters to see how they arrived where you met them in the comic book or the TV show.The writing is adequately grim, scary, touching and heartbreaking at all the right moments, since the start to the season finale in Episode 5. During the story there will be many prompts requiring a very quick reaction. Whether a sudden choice during a conversation, avoiding an attack or catching an object with a QTE or fending off a walker assault with a shooting reticle, the game may ask you to react at any time, often when you least expect it. The Walking Dead gameplay keeps you as involved and engaged in the narrative as possible at all times. The Walking Dead defined the gameplay features that would become the signature of other Telltale Games' productions like The Wolf Among Us and Batman: The Telltale Series. As the world we know collapsed due to zombie apocalypse, you are the convicted criminal who receives the chance to redeem himself. Buy The Walking Dead and survive through all 5 episodes! Buy The Walking Dead for 11,359.25 DXC?